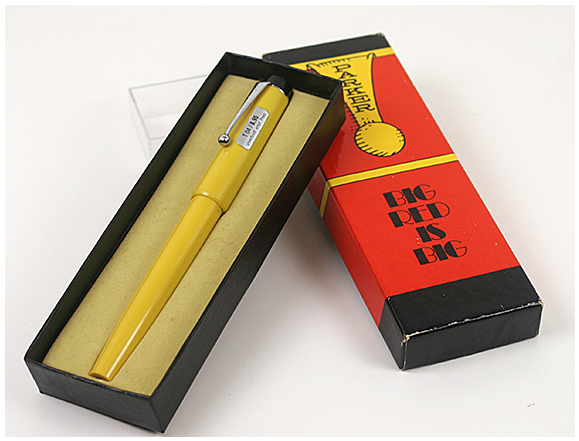 Although this 1970 Parker ”Big Red” Rollerball in Yellow is no longer available from Catalog #77, it is interesting to see how a vintage pen, mint in box, can still be a great gift or a perfect addition to a collection. This one was configured to use Parker Rollerball refills, was new-old-stock, and even had the original price label with the box. Refill was included, so it was ready to go. It’s a great size, and looks good – a perfect match to a Parker Duofold. And how about that box? Pen #34 in Catalog #77.